Respected dentist, Dr. Kevin Hogan, completes Sessions 3 and 4 from the Surgical Program by the Misch International Implant Institute. This training expands his knowledge of dental implant placement and bone augmentation to provide patients with more precise, reliable results with their dental implants in Mt. Pleasant, SC. With this training, Dr. Hogan can offer patients seeking a reliable tooth replacement solution with more precise, longer-lasting results with dental implants in Mt. Pleasant, SC. 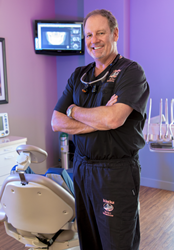 Dr. Kevin Hogan, a respected and experienced dentist serving the Mt. Pleasant, SC community, recently completed Sessions 3 and 4 from the Surgical Program by the prestigious Misch International Implant Institute. Completion of these sessions is part of Dr. Hogan’s commitment to continuing education in order to provide his patients with the highest quality and most advanced dental care possible. These surgical courses focused on precise dental implant placement and bone augmentation into compromised treatment sites. They also discussed treating the posterior maxilla to enhance Dr. Hogan’s expertise of dental implants for tooth replacement. With this training, Dr. Hogan can offer patients seeking a reliable tooth replacement solution with more precise, longer-lasting results with dental implants in Mt. Pleasant, SC. Dr. Hogan completed Session 3 in November. This session covered topics such as CBCT interactive treatment planning for more accurate dental implant placement and how to address any potential complications, such as compromised ridges and bone grafting. Advanced techniques, including small diameter implants, platelet rich fibrin for natural bone growth and indications for various types of membranes and the grafting procedure were also covered. These more specialized treatments enable Dr. Hogan to provide more customized care for his dental implant patients to address their unique needs. Dr. Hogan continued his training with Session 4 in January, which added to his previous sessions by extending to topics such as grafting techniques and custom treatment planning for specific cases. He is excited to bring this knowledge back with him to his practice to share with his team and patients. New and existing patients interested in learning more about dental implants in Mt. Pleasant, SC are invited to schedule a consultation with Dr. Hogan by calling 843-216-0908. More information about dental implants for missing teeth, the practice and Dr. Hogan can be found at http://www.smilesbyhogan.com. Dr. Kevin Hogan is a general dentist providing individualized care for patients in Mt. Pleasant, SC. Dr. Hogan is a graduate of the Indiana University School of Dentistry and has completed hundreds of hours of continuing education courses to stay contemporary with the latest dental technologies. In addition, he has also completed coursework with the Dental Organization for Conscious Sedation and has lectured at the University of North Carolina, Emory University, the Saginaw Valley University and AUA-American University of Antigua on head and neck anatomy and oral pathology. Dr. Hogan is a member of the American Dental Association, International College of Cranio-Mandibular Orthopedics, Academy of Laser Dentistry, International Association of Physiologic Aesthetics, Institute for Advanced Laser Dentistry, DOCS (the Dental Organization for Conscious Sedation), International Congress of Oral Implantologists and the South Carolina Dental Association. He is also a past member of the American Straight Wire Orthodontic Association, Maxillofacial Orthopedic Growth and Development, the American Academy of Pediatric Dentistry and the Functional Orthodontic Society. He and his team are dedicated to providing exceptional oral care to patients through personalized treatment plans. To learn more about the services offered by Dr. Hogan, please visit his website at http://www.smilesbyhogan.com or call 843-216-0908.